The physiological toll the 9/11 attack has taken on firefighters has resulted in 1,100 FDNY members being certified by the federal government as suffering from cancer, along with 2,134 cops and Ground Zero responders and 467 survivors. Alarming numbers like these have led to New York Senator Chuck Schumer and his New Jersey senatorial colleague Bob Menendez to push legislation to create a national registry managed by the Centers for Disease Control (CDC) that will help medical professionals more effectively track and treat firefighters with cancer. 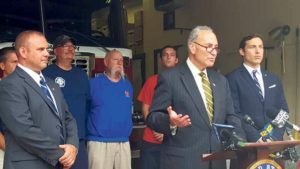 Schumer recently made the announcement at a press conference held at Garden City Fire Department headquarters. 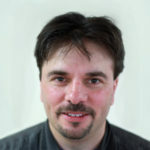 This very real issue comes in light of a 2012 New York City Health Department study that found no clear association between cancer and the debris at the World Trade Center site. But the results did reveal that of 55,778 New York residents who were present at the World Trade Center on the day of the attacks and had enrolled in the World Trade Center Health Registry, 1,187 had been diagnosed with cancer by the time of the study. The study further found increased risks of prostate cancer, thyroid cancer and myeloma. In addition, the FDNY’s chief medical officer, Dr. David Prezant, said more than 2,100 firefighters and EMS personnel have retired on disability with World Trade Center-related illnesses, mostly lung disease and cancer, since 9/11. As of last year, of 109 FDNY responders who have died from WTC-linked illnesses, 44 of them have been from cancer. Schumer explained how the registry could help in nationwide monitoring of cancer occurrences among all firefighters and help in the tracking, treatment and prevention of these cancer cases. According to a five-year study conducted by the National Institute of Occupational Safety and Health, there are twice as many firefighters in the U.S. with malignant mesothelioma, a rare type of cancer caused by exposure to asbestos, when compared to the general population. The same study also found that firefighters also have an increased risk of death from lung cancer and leukemia as compared to the general population. This can be traced to the exposure first responders have to harmful toxins and chemicals that are released into the air when everyday items like clothing and furniture burn. This national firefighter cancer registry would give public health researchers anonymous data that would greatly help cancer research, enable healthcare professionals to better track cancer incidences among firefighters and better improve understanding of cancer incidence among first responders. This, in turn, can lead to the institution of better safety protocols for firefighters going forward.